One of the things that inspires me when doing portrait photography is color. If there is a color or color scheme that is harmonious to my eyes, I'll use it as inspiration. This comes from basic color theory. If you understand color harmony, it can help with many things including background/location scouting, wardrobe selection, creating visually pleasing art and photography, just to name a few. I highly recommend you learn it. 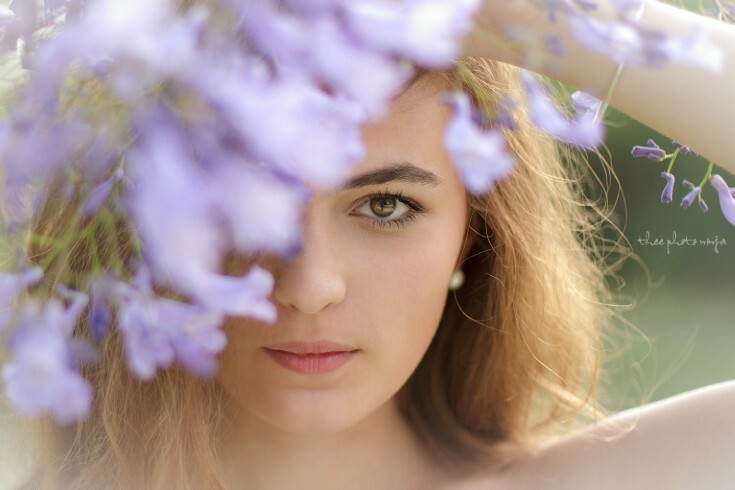 In this photograph from a recent shoot with KPT Model, Emily, I used the lavender color from the flowers in the foreground with the green grass and trees in the background to create a complementary color harmony. What do you think about this photograph? Please click "Like" above to share! Ada Mills - This picture is very interestingly soft looking. It shows the right type of feminine beauty. The art of showing what is looked upon as being a real person, sometimes needs to include props of vibration of color. Flowers are always a good choice to add color. Good "Macro Quality", but just a touch too much out of focus. Nina - I can't believe as a graphic designer I never consciously made shooting decisions based on color theory!!! What the heck?!?!? So glad you posted. So, so, glad!